ATHENS & LONDON : Verifavia, the world’s leading emissions verification company for the transport sector, today announced that it has fully certified Greek-based maritime information and communication technology (ICT) solutions provider DYNAMARINe’s Emission Monitoring system against the EU Monitoring Reporting and Verification (MRV) regulation requirements. From 2018 onwards, owners and operators of ships exceeding 5,000 GT will be required to monitor, report, and submit their independently verified carbon emissions on all voyages to, from and between EU ports. The data collected will be made publicly available for over 10,000 vessels visiting EU ports. DYNAMARINe’s Emission Monitoring system is designed to enable technical operators to access energy data monitored on board to optimise the energy consumption of the ship. In addition, the system provides numerous analysis tools and functionalities to help identify inconsistencies, errors, and any unanticipated deviations in the data – ensuring they can be corrected before a conclusion on the ship's overall performance is made. Compliance with the EU MRV Regulation and the collection of CO2 data for over 10,000 ships presents a significant challenge for the shipping industry. To keep apace, new and innovative ICT solutions are emerging to assist owners and operators with auditing purposes. However, to support monitoring and reporting that satisfies compliance requirements, it is essential that these new processes are fully certified. 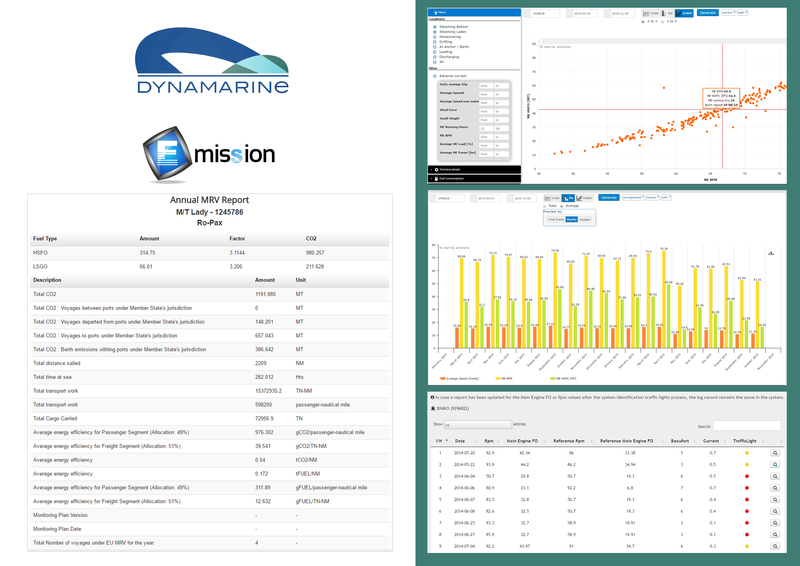 To obtain certification, DYNAMARINe’s Emission Monitoring system was assessed against the requirements of the EU MRV Regulation (2015/757) in terms of process and functionality. The system effectively demonstrated its ability to automatically generate both voyage reports and annual reports for individual ships – taking into consideration the location of the ports of call, and the cargo / pax activity at these ports of call throughout the year. Verifavia Shipping provides global ship owners, operators and managers with independent emissions verification information and services that enable them to navigate the requirements of compliance efficiently and effectively. Focusing entirely on its area of expertise – independent carbon emissions verification for the transport sector - with no other vested interests in the maritime sector, the company is entirely independent. Verifavia Shipping strives to be the maritime industry’s first choice for the provision of emissions verification information and services. The company works as a trusted partner for its customers, supporting them in achieving compliance with an independent service grounded in accuracy, integrity and expertise. For more information about Verifavia Shipping, visit us at http://www.verifavia-shipping.com. For up-to-date information and news about the MRV Regulation, follow us at http://twitter.com/VerifaviaMarine. DYNAMARINe provides high quality consultancy services to the maritime community. It has services associated with risk management, technical studies, statutory compliance issues, and condition surveys. It also has the experience to undertake specialised and innovative projects, supported by a strong in-house software development team. DYNAMARINe is specialised in developing shipping related software (such as onlineSTS.net, Emission Monitoring, myfleet360.net, online training platforms etc.) and also provides customised IT solutions to customers. The company is committed to maintaining a high level of quality in all the services offered. For more information about DYNAMARINe, visit us at http://www.dynamarine.com. See more corporate news also at https://www.linkedin.com/company/dynamarine.